The next morning I asked Tony if he knew where my Bible was. He nearly fell out of the bed. Neither of us had seen it for about 2 years. We both knew then that something significant had happened. That day he spent time with a friend who poured out his woes for hours. A lot of it was unhelpful. Tony came home feeling awful and fed up. He was on to lead worship the next day in our Sunday meeting and he didn’t want to do it. We were in our bedroom and he was pouring it all out on me. I asked him if I could pray for him. He looked at me with a, “Who are you and what have you done with my wife?” look in his eyes. I stood next to him and put my hand on him. As I started to pray, he fell onto the ground. It was the last thing I expected and there was no one to catch him. He lay there for a while and then got up and prayed for me. Before we knew it we were both lying on the bed next to each other being covered by the blanket of grace. That was a first. It was the most intimate moment of our married lives together. We got up refreshed and so happy. The next day was Sunday. I was shaking all over, knowing that I was going to share what God had done in my life. During the worship time I got up and said, “Today I am in church for the first time in two years because I love God. I have been coming for all the wrong reasons; because I am an elder’s wife, because I have wanted to be a good example and because its what Christians do. But today, I really want to be here. I have been like a dried up stump. Something had died. I did everything I could to make it come alive again, but nothing worked. Just two days ago, I surrendered to the grace of God. I gave up. Abraham and Sarah were like dried up stumps. They had nothing in them that could possibly make life happen. They were as good as dead. Well, I have been as good as dead. It was just the scent of water that I needed. Just one whiff of grace, and life came to me. Tony then shared what happened to him and asked if anyone else felt like we had felt. Dry, barren and dead. He invited them to come forward. We stood there and watched as more than half of the church came forward. That was 1989. We started hearing about similar things happening all over South Africa with Fini and Isi De Gersigny, Rob Rufus and others. It seemed that some sort of simultaneous reviving of the church was taking place. It was exciting. We saw many of our friends touched and transformed. There was an “Exploits” team started and we got in to hospitals, villages and anywhere else there was an opportunity to go. Some amazing things happened. Our businessman friend, Tony, was the most miserable wealthy person we had ever met. As far as we could see, he had nothing to be miserable about, but he was. One day during a prayer time, Tony started laughing. He laughed so much that he fell onto the floor. He lay there like a kid, kicking his legs in the air as if someone was tickling him. It went on for ages. Finally he managed to get up and get to the microphone and say, “I was a born pessimist. I have been a pessimist all my life, but to day I have been set free from pessimism.” He was a changed man. We took the “Exploits” team to a little Shangaan village called Gazankulu in Northern Natal. One of the biggest miracles was that, now-happy-Tony, was happy to do some off road driving in his BMW along the dusty, bumpy village roads. The villagers loved him for it. 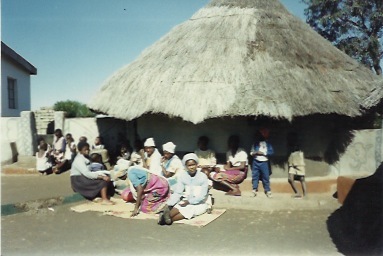 We slept in the kraals made of mud and walked into the darkness to do our ablutions in the only long drop there was. Meetings were scheduled to start at 5pm. Whoever was there started singing. People from all around heard the sound and started walking and adding to the song. An hour later we were still singing and the crowd kept growing. There is nothing like listening to African harmonies under a full moon. While we were on a beach holiday that year, we tried our best to avoid people. We needed a break and didn’t really want to get into long talks with anyone about anything. Asha and Zoe felt differently. They wanted to make friends. They brought their little friends to the table to meet us and before we knew it, we were chatting to their parents. We found out they lived right next to us in Johannesburg. We also found out that the mother was a satanist high priestess. She told us all about it. It was dark and she was scared about how deep she had gone. We shared our stories of faith with them and they were moved. Their marriage was in trouble and they needed help. We prayed with them and they surrendered to the God who loved them more than anyone else did. When we got back to Johannesburg we invited them to attend some Rob Rufus meetings. She sat through the first one doing everything she could to stop herself from strangling Rob. All she could think of was how she was going to kill him. That afternoon we were at Rig and Sue’s place waiting for them to come for prayer. They drove past our gate twice, not being able to drive into the driveway. There was a dark force trying to stop them from getting to us. It took all their strength to get there. There were four of us; Rig, Tony, Rob and myself. Rob started to pray and told the forces of evil to leave her life. Rigby was holding onto one arm and Tony on the other. She started to speak in a deep gruff man voice, saying over and over again, “She’s mine, and you’ll never get her.” She flapped her arms up and down, lifting Rig and Tony off the floor a couple of inches. Rob went in to fits of laughter. He knew it wasn’t going to be long before she was free. When she was, she slept for two days; totally exhausted. She woke up, a new mother, wife and woman. These exploits went on for a year. The more we thought about India, the more we knew we were going to need all the help we could get and we were getting the feeling that the time was getting closer for us to leave.